Heather J from Age 30+ ... A Lifetime of Books was the winner of the Best Historical Fiction blog during the recent Book Bloggers Appreciation Week. We couldn't wait for her to do a Why I Love piece for us to see why she loves historical fiction so much! When I received the post, I must confess that I teared up a bit, and then I thought it would be a perfect post to post on 11 November - a reminder that in the midst of all the tragedies of war, people who would never have met otherwise were bought together. 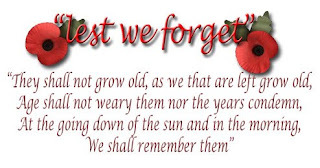 For those who have fallen during time of War, lest we forget. I love historical fiction from all time periods but there is one era that catches my attention every time: World War II. In fact, the genre doesn’t matter as long as the time period is correct. Why? Because the events of World War II led me to be who I am today. On June 6, 1944 Private Nicholas Fontana of New York landed on Utah Beach. Despite the intense fighting, Nick succeeded in making it off the beach without any injuries. His unit fought their way inland over the next several days. At one point a sniper’s bullet ricocheted off Nick’s helmet just after he pulled it into the correct position. Another time he twisted his ankle jumping over a hedgerow to avoid a German patrol; that injury caught up to him a few days later just outside the town of St. Lo. A German soldier appeared out of nowhere and threw a grenade at Nick’s unit. His twisted ankle kept him from moving fast enough and the blast knocked him to the ground, filling his legs with shrapnel. Meanwhile, across the English Channel, 22-year old Eileen Hunt was doing war work in a Coventry factory along with other girls from town. Eileen was a gorgeous and independent red-head. Her job in the factory was to make needles, and she was paid by the gross. Eileen’s family had survived the repeated bombings of Coventry by sleeping most nights in the fields outside town, all the while worrying over her brother who was working as a fire watcher. In October 1944, Eileen’s older sister, Mary, set her up on a date with an injured American soldier she’d met. According to Mary, this soldier, Nick, had a cast on one leg, walked with a cane, and was the perfect man for Eileen. Neither Eileen nor the soldier was interested in this blind date but each was bullied into going. Eileen was running late and Nick was ready to give up when they saw each other across the street; it was love at first sight. It took until December 1946 for the couple to be reunited in New York where they were married on January 18, 1947. In January 2010 Nick and Eileen – my grandparents – will celebrate their 62nd wedding anniversary. Without the events of World War II to bring them together, Nick and Eileen would never have met and my family as it exists today would never have come to be. I love hearing my grandparents tell their stories. Reading books about this time period helps me to imagine more fully what their lives must have been like. And that is why I love books set in World War II. Beautiful! Thank you for such a wonderful post Heather! Thanks to Marg and the rest of the HT bloggers for inviting me to post. I'm happy to share my story with all of you. My grandpa's best friend was killed during WWII so I'm specifically remembering him today. His name was Joe Tofinchio. Beautiful story! I'll put a link to this on War Through the Generations hopefully later today! That's so cool! Thanks for sharing! Both of my grandfathers served in the Navy in WWII. They are both gone now, but I was fortunate to have them both in my life well into adulthood and I remember them both every day. Thank you Heather for sharing this on Veterans' Day. You are so blessed. What a lovely story and tribute to your grandparents! What a great story of enduring love! Thanks to your Grandpa and Joe and all the others who have served. Thanks for a great story of enduring love. What a great tribute to your grandparents and your entire family. Wonderful "how we meet" story. I am so glad that your grandparents have made it to celebrate 62 years. Your post really made them come alive for me -- thank you for sharing it.